I just returned from a fall break road adventure with my family. First of all I need to thank SO many of you for the kind words on my 7th blogging anniversary. I was so humbled and honored that so many of you would take the time to do that. I know I will never be able to thank you individually, so please accept this thanks as a pathetic substitute. Second, I need to apologize for not getting the winners drawn and announced before we left for our fall break. I was frantically trying to wrap up all my loose ends before we went out of town – including a bunch of sewing for Quilt Market this week – when I got one of those phone calls from the school that one of my kids had fallen at recess. So after rushing to the school, a trip to the Urgent Care clinic for x-rays, and a diagnosed broken collar bone, there went the time I was going to get all those other things on the ‘to-do’ list done. So thank you for your patience! Winners will be announced later today! Despite our un-welcome collar bone excitement, we had a great fall break (no pun intended). We embarked on an epic road trip south to Arizona this time – our primary destination was the Grand Canyon. I was the only one of the six of us who had ever been there and it’s been about 25 years since then. I thought I’d share a few pictures from the trip since it’s such a unique part of the country. And because it’s pretty spectacular scenery. It really is that vast. Even in person, you feel like you’re staring at the painted backdrop from an old western movie. We felt a little bit like the Brady Bunch, except we didn’t ride any mules, or find a creepy old ghost town, or drive a sweet station wagon. But we did do a couple of hikes (and we did see other people on mules!) These shots are from the Bright Angel trail. It was so cool hiking down into the canyon. So much more vegitation – and more beautiful – than I expected. Plus we talked with a bunch of nice folks along the way, including a charming older couple from Normandy, France – hiking the 12-mile round trip out to Plateau Point – and a couple from Chester, UK and Bristol, UK as well as a variety of locations across the US and Asia. The kids and I only did 3 miles round trip. We also hiked Shoshone point (third picture in this post) which is kind of a hidden gem and we had the place all to ourselves for a long while. Here’s some southwest inspiration for you. This is the Desert View Watchtower, inspired by ancient Pueblo watch towers and designed by architect Mary Colter. It was completed in 1932. The details were so cool. I love that stone work at the top of the tower. I’m kind of fascinated by Mary Colter now and want to read more about her. These re-creation murals on the inside of the tower were done by Hopi painter, Fred Kabotie also in the 1930’s. We visited other little towns in eastern Arizona where my grandfather’s family pioneered some tough territory. These pictures are from the Stinson pioneer museum in in Snowflake, Arizona. 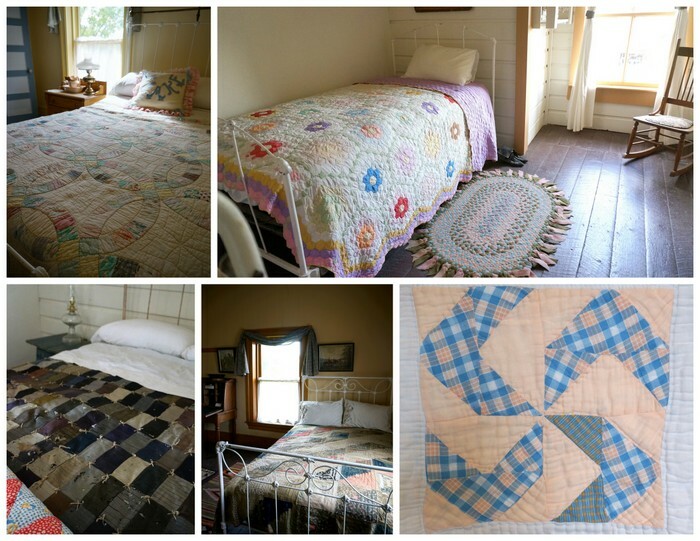 All of these quilts were in the Victorian-era Flake Home next door. Another ancestor’s home, built by Jesse Smith in Snowflake. 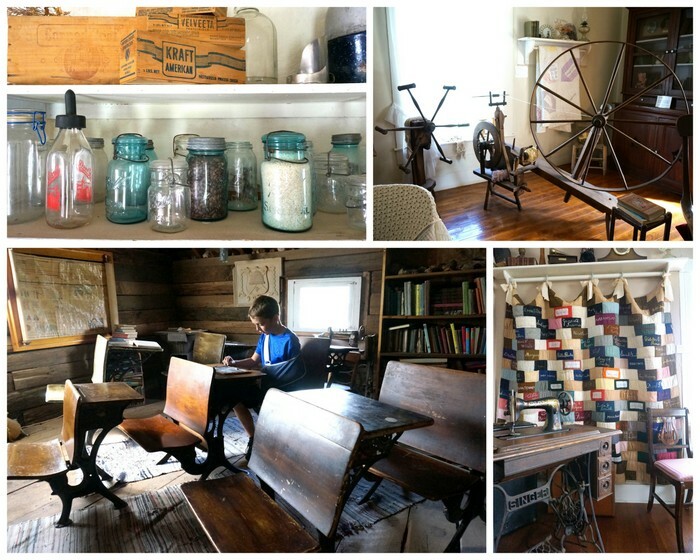 It’s a beautifully-kept old home, full of family memorabilia. It’s common knowledge that I’m a sucker for all old quilts, but imagine my utter joy finding this quilt made by and for my great-great grandmother, Janet Smith. The quilt is made up of signature blocks and I even found the block made by her daughter Leah (my great-grandmother). Here’s a picture of Janet and Leah together. I met Leah in my lifetime – she passed away when I was two. It was so fun to find this connection to my own people. I love the large Baptist Fan quilting. You can tell it was done as a group effort/quilting-bee style as the Fans start in different directions on both sides of the quilt and work toward the middle. And then, even better – this quilt made by Janet’s mother (also Janet, just to be confusing). It’s really similar to the Pine Burr quilt in this post. I need to try and get up the guts to make one. But probably my favorite stop was this ranch in Hunt, Arizona (not even on the map!) where Leah lived and raised her family – including my grandfather. With no electricity or running water, she delivered 3 of her 10 babies (and loved them all) here. As the family grew, they later moved to Phoenix, but they still spent summers at this ranch. She felt like they were the happiest times of her life. Seeing that little 4-room house chokes me up a little. I couldn’t have done it, but I’m sure grateful she did. She raised an amazing bunch of people. Coming home made a few more stops along the way, including Canyonlands National Park where we hiked again and saw really old Native American art. We also hit a spectacular sunset in Monument Valley. We are proud National Park junkies. (You can see some of our past adventures here.) Next year is the centennial of the National Park Service in the United States. Pardon the phone snap-shot of a print at the Grand Canyon gift shop, but I came across these quilt block designs to commemorate each National Park for the centennial. I’m really intrigued! This is all I’ve found about them online. If anyone knows more, let me know. They are some beautiful blocks! And now we’re home again. It was such a good trip. The kids were troopers – especially the one with the broken collar bone (although, truthfully, he was the most cheerful 😉 ) – and my husband was the biggest trooper doing all that driving. In addition, I always love road trips to get some good handwork done. I got two more quilts bound on the road – including this one that will be a new tutorial on Wednesday. Stay tuned! Wow what a memorable trip! The scenery is gorgeous and the history, especially your family ties, makes it so interesting. And the quilts, to see those in person had to be an amazing experience. Hope your little guy heals up soon! Love your beautiful photos, your quilts and your blog. Thanks Aniva! Do you know if there will be block instructions? Or are they just screen-printed designs? This is what I’m wondering too! How fun would it be to piece the ones for the parks that one has visited!? Do let us know if you find that they are releasing a pattern! Go to National Park Service Centennial blog and it will tell you all about it. You can purchase fabric prints and get the pattern for free to make items with them. You always have such interesting blog posts no matter the subject. I love that you saw so many family connections, it is harder and harder to see those these days. Broke collar bone…no fun but at least there isn’t a cast! So…you love the National Parks like I do…did you see there is going to be a NP quilt exhibit at Houston this year? I have one there….Wind Caves….here is some info..
Oh, cool! Thanks for the link! What gorgeous pictures!! Looks like an amazing road trip! Especially loved the wedding ring quilt and the red polka dot one. What a fantastic road trip and wonderful to be able to visit your family’s past. The quits are beautiful, quilting is in your DNA! What a wonderful and amazing trip! I think you will remember it for a long time, won’t you?! I would love to see the home of my grand-grandparents . I only know them by photos. Such a fabulous trip! I will keep this post for future reference, definitely things here we want to visit some day! Thank you for so many pictures. Thank you so much for your beautiful photos, I live in UK and have no hope of ever seeing the Grand Canyon, I have seen lots of professional shots but yours are so much better and different. How marvellous to travel back into your ancestry too. I do hope your little one’s collar bone is well on the way to being fully mended, and it’s great that it didn’t stop your travel plans. What a memorable trip. 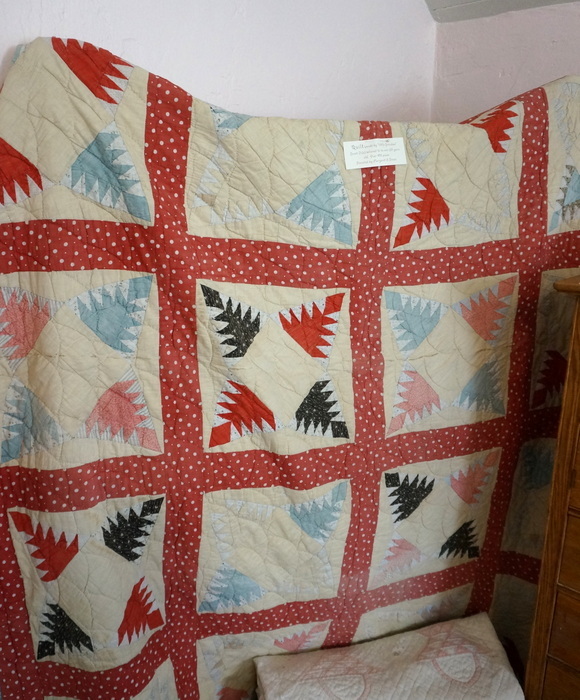 How wonderful for you and all your family to be able to visit historical family locations and see so much preserved, especially the history of quilting in your family. Thank you so much for sharing. So fun to read about your adventures. The pictures are beautiful and so is seeing your family history. And thanks for sharing how life (broken collar bone) happens. Because it does! Amy, there’s a book that seems written just for you: “No Time on My Hands” by Grace Snyder. She wrote her memoir in her eighties, after a lifetime of making exquisitely appliquéd quilts–in Nebraska homesteading cabins! 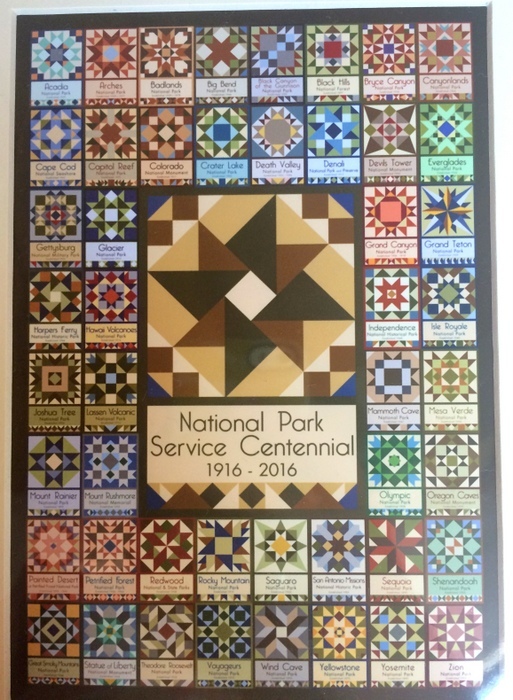 Hoping to find printed piecing directions for the National Parks Centennial quilt blocks. What a great project! Oh thank you so much for that recommendation! That does sound like something I would enjoy! having just come back home from some of that area last week I appreciate seeing those photos – we didn’t do the Grand Canyon this time but we were in south west Utah and so enjoyed the area once again – we were at Canyonlands several years ago and love that area so much. Must have been really nice for you to see places your family lived and articles and homes that belonged to them! We are national park junkies as well and love them. Sounds like quite a trip! 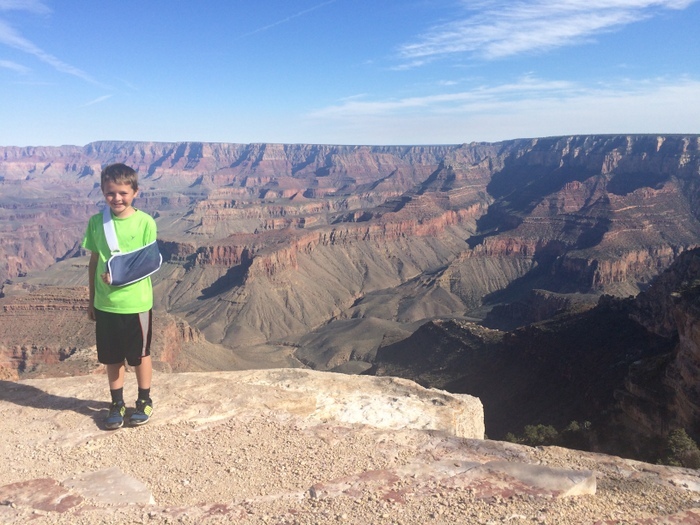 Beautiful scenery — I love your Shoshone Point photo — and all those family connections! I’m intrigued by the NPS quilt blocks too. I don’t know amy more about the NP block but I started collecting them this summer on vacation. Not sure what the plan is for them yet but I like them and think they will be a great way for our daughter to remember all the trips we took. Love your vacation pictures! What a wonderful trip, and all the family history made it so special….some awesome memories!! I had to smile when I saw the picture of your son sitting in the classroom setting…I have a desk like that! It came out of an old one-room schoolhouse here in Virginia. Thanks for sharing your vacation! I Love this post! So very cool to know your family’s history and to show it to your children. What a special gift. Wow, wow, wow! What beautiful pictures! I’ve been to the Smoky Mountains, but my dream is to go out to the Rockies one day. Thanks for taking us along. Thanks for sharing your adventures. What an amazing treasure to be able fto find your family history like that. And thank you for showing the National parks quilt blocks. I found the one for the park near us – the Colorado National Monument. Such magnificent photography! And what fun it was to follow you tracing your roots here in our state. Loved hearing about your adventure and all the history. It is exciting and amazing. Thank you for all the beautiful pictures of quilts and the awesome scenes!! Such wonderful family history in all those structures! Thanks for sharing photos and family history, God bless you! Looks like a fabulous trip! Thanks for sharing!!! Thank you for sharing these spectacular pictures! We took our three sons to Arizona and had an amazing visit to the south rim of the Grand Canyon. Beautiful quilts and great stories. Wow. Phenomenal post, Amy! Thanks for sharing your adventures and photos with us. Wow beautiful trip and so nice to be able to trace your past, my grandparents land and house are now a housing subdivision, so nothing to show my grandchildren. I am from the UK and we were fortunate to spend a month in your beautiful state this summer. We visited Moab for Arches NP and Canyonlands before driving down Highway 12 to Escalante, Grand Staircase, Bryce Canyon and Zion NP. We took a day trip out to the North Rim of the Grand Canyon. It was all absolutely breathtaking and I am so glad we came. They are amazing places, aren’t they? So glad you could come! And our family loves visiting the gorgeous spots in your country! I thoroughly enjoyed this post. I love family history- how great that you could trace your roots and see such a real piece of your past. None of my grandparents were born in the US. My parents are both first generation so we can’t really see our heritage as you were able to. So cool. Also glad that I read through the comments because there are a few interesting links to look at as well as a book that seems like it might be a good one. Great conversation! Thanks Amy. I came across this site several days ago when I was looking for something – http://americanquiltblocks.com/catalog/-c-260_718.html . Not sure if this helps you or not.